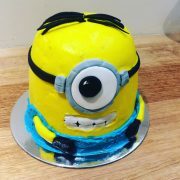 I know most of the Minion cakes are covered by fondant to keep the neatness of the cake, but I’m sure all of you will tell me how yucky is the fondant cake. No question asked that the fondant has preservatives in them and glucose and other stuff you don’t want to know about… but cake makers just can’t avoid making cakes without fondant as that’s what customers want. 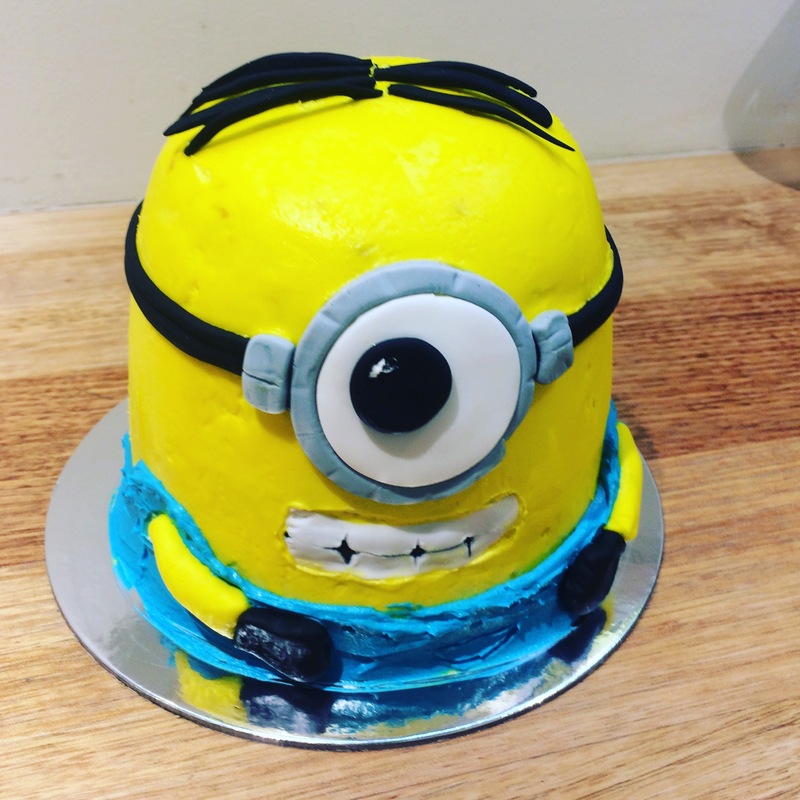 So this time I want to make a Minion cake without using too much fondant, but still have the cuteness and neatness. I stacked 2 baby cakes together and carved the top one with knife to make a Minion head. Then cover all the surfaces with yellow vanilla buttercream! You will find the cake already looks like a Minion… After that it’s time to make all the details of the Minion, like the goggle, hair, mouth and teeth, and finally the gloves. Basically that’s what it needs. Before the fondant parts getting hard and dried let’s put them on the Minion cake. The blue shirt I’ve done it with buttercream, just pipped them onto the cake and here you have a Minion cake! Celebrate Halloween with Cupcakes! Giant Burger Cake for Abbey!